Paypal the number one choice for online payments transactions don't really works in Nepal as Nepal Government and Nepal Rastra bank don't permit paypal in Nepal. So one can fund paypal account to send other but no nepalese paypal account can receive money through paypal. But there is one payment gateway that allows both receiving and sending money online in all countries including Nepal. A bank account in any of the Bank in Nepal and use SWIFT-Code of your bank nad your Bank account number. An international Credit Card or Debit card. 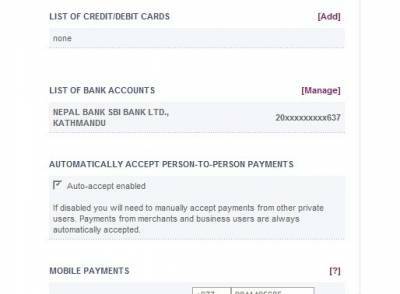 Above is my account with my Bank account in Nepal SBI Bank connected. Start earning and receiving money online.